How Hape Noah’s Ark will help introduce the celebration of World Environment day on the 5th June to our children. World Environment Day is celebrated to raise global awareness to take positive environmental action to protect nature and the planet Earth. With this year’s theme: ‘go wild for life’, which is raising awareness about the illegal trade of wildlife products. Hape Noah’s Ark toy will help teach children about these magnificent endangered animals that need to be saved by us, much like they needed to be saved by the ark from the flood in the famous bible story. 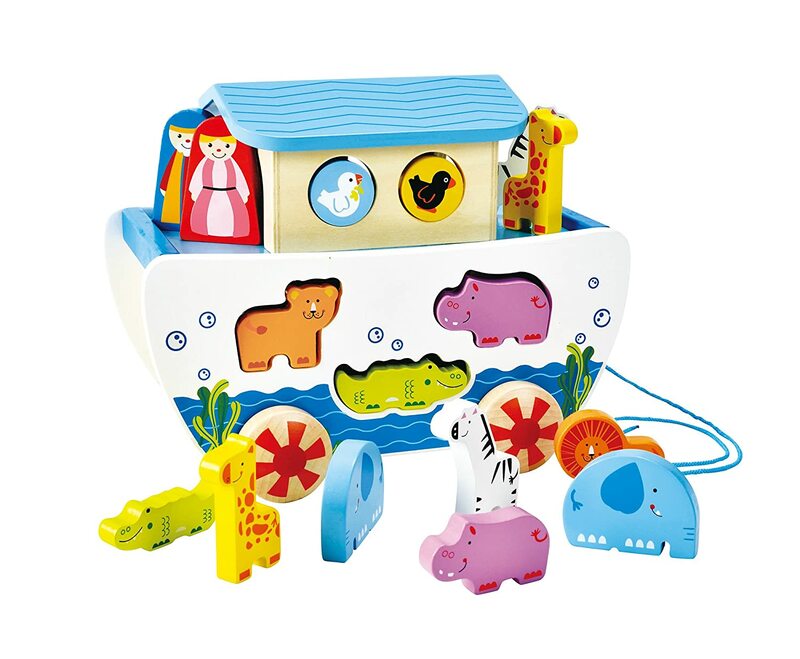 Hape Noah’s Ark is the perfect addition to any nursery. Not only is its stunning design and finish beautiful to behold, but its many features serve children throughout the developmental stages of early childhood. When picking up each character and arranging it within the ark, the child will be building on their motor skills and co-ordination. As they grow and begin to walk, the ark can be dragged along on its wheels by the pull-string attached. Little ones can start exploring the world with their favourite toy in tow. Better still, due to the high quality chunky wood that makes up the ark and its inhabitants, this is a product that is made to last. It can remain a treasured part of the family for years as new little additions enter, due to it being gender neutral. What really sets Hape aside though as toy manufacturers, is their commitment to building toys with sustainability at the forefront of their consciousness at all times; “from the beginning of the design process, through production and delivery, to the final unwrapping of the consumer packaging, Hape toys are a collaboration of global thinking and responsible ecology”. One of the many issues facing the world is the amount of waste that is disposed of on landfill. Not enough renewable or sustainable materials are being used and there is always a growing demand for more places to discard rubbish. Hape recognise that “the future begins and belongs to our children”, and by using all natural materials, as well as water-based, non-toxic paints and glue, they are reducing the impact of this generation’s actions on the next.